It is thought that that the development of water mills in Europe was encouraged by the corn mills that were run by monks. Travellers brought back details of Chinese mills, which had been used for more than a thousand years, which the monks seized upon to make improvements to their own mills. One of the earliest mills in Exeter was that of the Cluniac monks of St James, who in the middle of the 12th Century built a mill at Salmon Poll. A little later, sometime between 1180 and 1190, Robert Courtenay granted to Nicholas Gervaise "...all his water which Thomas the fuller holds of him outside the west gate of Exeter, which is between his corn mills and Crickenpette, so that the said Nicholas and his heirs may build a mill on the said water towards Crickenpette as shall appear best and most commodious to them". This is the earliest record of a mill in Exeter. In 1403 the City recorded that "An Ordinance made by the Mayor and Common Council of this City, that every Baker within the same, and Suburbs thereof, should from time to time, grind all his Corn at the Cities Mills, &c. Duryurd and Cricklepit." Over the next few hundred years, water wheels were used for much more than grist mills (grinding grain). Mills would grind malt, bone, corn, snuff, drive sawmills and machinery for forges, smithies bellows, leather tanning, a dye works, produce paper, and most importantly, hammer woollen cloth in a process called 'fulling' and 'tucking'. Just about any industry that needed power could use a water wheel. The wheel was driven by water from a leat, and Exeter had two leats running through Exe Island. See Leats of Exeter. Exeter was the south west's centre for the finishing of woollen cloth; the process called fulling required a water wheel to drive the machinery. The cloth was washed in stale human urine, which contains ammonia, and fullers earth. The serge was folded over and placed in a wooden holding cradle and pummelled with large square wooden hammers, or fulling stocks, driven by the water wheel. This process would cleanse the wool of oils, dirt and other impurities and thicken the fibres by matting the surface texture. Every night, urine was collected from taverns, inns and houses by women with 'piss carts'. The serge was thoroughly washed in river water to prevent it shrinking, and was taken to be hung on racks in drying sheds, and more usually, rack fields. The phrase, 'being on tenterhooks' comes from hanging the cloth on frames called tenters, using tenterhooks. The rackfields were also known as the tenterground. Sources: Izacke Remarkable Antiquities of the City of Exeter, Jenkin's Civil and Ecclesiastical History of the City of Exeter, Exeter 1540-1640 by Wallace MacCaffrey,Murray French, Water Mills and other Water Powered Sites in Devon by Martin Bodman, Devon Archaeological Society - Excavations on the site of Bonhay Mills, Trewman's Exeter Flying Post and the census records. 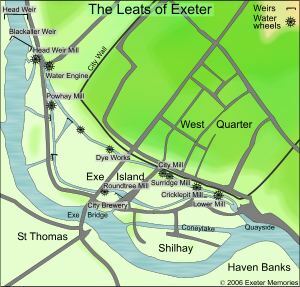 The map shows the position of some of the many mills that lined Exeter's leats. Undershot wheel - a wheel where the water passes under the wheel - Exeter's wheels were undershot. Grist - general term for grinding grain. Millstone - two stones with flat faces - the grain is fed through a hole in the middle of the top stone, known as the runner. The runner rotates and grinds the corn into flour on the lower stone called the bed. They typically run at 120 RPM.